^ Gibson, Andrew. "Orlando nightclub shooting timeline: Four hours of terror unfold". Orlando Sentinel. Retrieved 16 February 2019. ^ Berzon, Alexandra; Emshwiller, John R. (June 17, 2016). 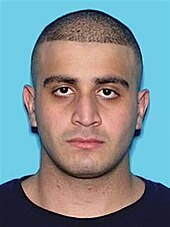 "Orlando Shooter Was Dismissed From Academy Over Gun Inquiry, State Says". The Wall Street Journal. Archived from the original on June 18, 2016. Retrieved June 18, 2016. (Subscription required (help)). 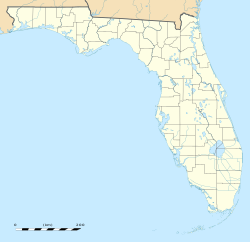 Susanne Coburn Laforest, a 61-year-old retired corrections officer and former classmate of Mateen, said he threatened to shoot his classmates at a cookout—which she said was held on a gun range—after his hamburger touched pork, in violation of Muslim laws. ^ Woo, Stu (June 13, 2016). "Orlando Nightclub Shooting Puts G4S in Spotlight Again: U.K.-based security giant that employed Omar Mateen said its vetting had raised no red flags". The Wall Street Journal. Archived from the original on June 13, 2016. Retrieved June 13, 2016. (Subscription required (help)). ^ Paletta, Damian; Shallwani, Pervaiz (June 16, 2016). "Orlando Shooter Traveled to Saudi Arabia on Trip Organized By NYU Center". Wall Street Journal. Archived from the original on June 20, 2016. Retrieved June 21, 2016. (Subscription required (help)). Rep. Adam Schiff, the top Democrat on the House Intelligence Committee, said law-enforcement officials are searching for details about the Saudi Arabia trips Mateen made in 2011 and 2012 for a number of reasons. ^ Lush, Tamara (2018-03-30). "Widow of Orlando nightclub gunman is acquitted in the attack". AP NEWS. Retrieved 2019-02-21. ^ "Pulse survivor: Acquittal of shooter's wife is 'devastating'". Fox News. 2018-03-31. Retrieved 2019-02-21.